What is a Public Adjuster and why use a Public Adjuster? A Public Adjuster is the only adjuster exclusively licensed to represent the interests of the policyholder throughout the claim process. We work for you, NOT the insurance company. Many contractors will refer to themselves as ‘Insurance Claim Experts’ and offer to represent policyholders during the claim process, this is often times considered the Unauthorized Practice of Public Adjusting and is NOT legal and often times they are only ‘experts’ at ensuring they make a lot of money and truly don’t have the knowledge or experience needed to obtain the full and proper settlement for all of your damages. In the event that you suffer damage to your property and you are looking for assistance with your claim, a qualified Public Adjuster or an attorney are the only professionals specifically licensed to represent your interests. Unlike insurance company adjusters that are hired, paid and trained by the insurance company to represent their best interest, a Public Adjuster works directly for you and will handle your claim with ONLY your best interests at heart. We know what it takes to recover the maximum settlement for all of your losses, while ensuring that you fully adhere to and cooperate with all of your post loss obligations. 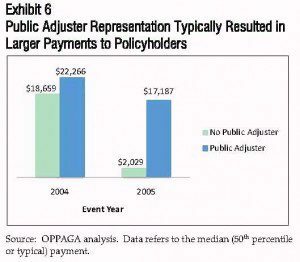 for claims related to 2005 hurricanes, policyholders who used a Public Adjuster resulted in payments that were 747% higher than those policyholders that did not use a Public Adjuster. What is a Public Adjuster? This study says it all! The next time you hear someone ask, what is a Public Adjuster, you can tell them they are the ONLY adjusters with your best interest at heart. As Public Adjuster there is never any upfront cost for our services. Everything we do is strictly based on a contingency fee agreement…we only get paid when and if you do! In the event that you have an insurance claim whether it is a small homeowners claim or a complex commercial loss, you should always consult with a licensed Public Adjuster to discuss your loss. If you have looked at your insurance policy lately you will see that they are complex by nature and much of it seems to be in another language. Most Public Adjusters will offer a free claim consultation and if nothing else you will learn a lot about your policy and how the claims process works. When you file a claim the insurance company sends out an adjuster that is going to be very familiar with your policy, you deserve to have the same if not better representation than the insurance company has, it is the only way to level the playing field! In a perfect world their would be no need for public adjusters, you pay your hard earned money for a policy to protect your property in the event of a loss and that is exactly how it should work. However, unlike what the commercials will tell you, that is not the case. Insurance companies are brilliant in that they want to continue to take in premiums but they do NOT like to pay out on claims, it hurts their profits.